Global Asia Blog | The Nuclear Security Summit: talks about everything important, and nuclear material. The Nuclear Security Summit: talks about everything important, and nuclear material. The NSS is a summit for countries to discuss nuclear terrorism, or more importantly, how to prevent weapons grade nuclear material from falling into the hands of terrorists. The summit was hosted for the first time in 2010 in Washington on the initiative of President Barack Obama. The summit was the product of a speech he gave in Prague in 2009, in which he called Nuclear Terrorism one of the greatest threats to international security. The summit was however much more than only talking about nuclear terrorism. The two days in The Hague were used for a whole variety of topics concerning the world today and as much as I would like to talk about the summit itself I am going to take a closer look at what happened around the summit. The topics that were discussed around the summit were of much higher importance, because they are present issues whilst the summit is focusing on preventive methods of counteracting nuclear terrorism. It is not strange then that after the first day I was more interested in what was happening around the summit. 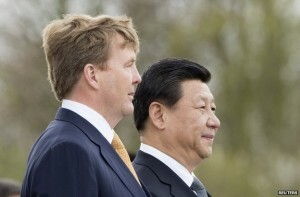 Dutch increase in trade with China. The visit of the president of China shows even more to the Netherlands that they value our trade agreement and that this will only continue to benefit both nations in the future. 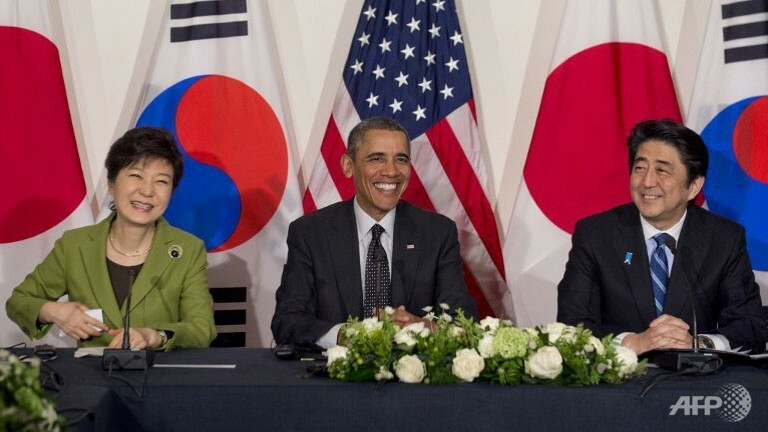 The summit was an opportunity for the President of the United States Barack Obama to sit down with two of its most important Asian allies: South-Korea and Japan. The reason for the talk were the mounting tensions between the two Asians powers which frustrates the U.S. administration. 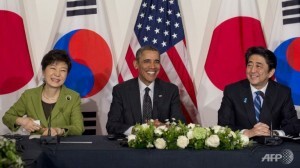 President of South Korea Park Geun-hye, President Obama and Prime minister Shinzo Abe during their trilateral meeting in The Hague. 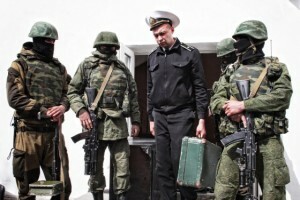 A Ukrainian officer leaves naval headquarters in Sevastopol as local militia stands around him. Whilst further sanctions might follow as a result of the G7 talks, it has become obvious that the current sanctions already have a heavy effect on Russia. With the freezing of assets of Russia’s most wealthiest people in Europe and other financial sanctions Russia already lost between $45-$50 billion US dollars in the first three months of this year. 8 In comparison they lost $63 billion in all of 2013 which was mainly caused due to the acquisition of TNK-BP by state oil firm OAO Rosneft worth an estimated $60 billion. 9 I do not know up until which extent the Russians forecasted these losses. I think it is clear that taking over Crimea will come at a serious price for Russia. Looking back at the eventful two days in the Netherlands which were very interesting to watch from the other side of the world, I think that the classical format of having a summit which focuses on only one subject is not of this era anymore. While serious progress has been made on the counteraction of nuclear terrorism, I think that the focus was also going to what countries had to discuss among each other in order to cut out another visit to discuss these topics. I think that even though we have made a great leap in communication technology, the need for face-to-face dialogue between state leaders still remains. That this has to do with the fact that you never know who’s watching you when skyping I’ll leave in the middle for now. I have a strong belief though that across all fields the Nuclear Security Summit was a huge success. Tagged China, Crimea, G7, Japan, Netherlands, NSS, Nuclear Security Summit, South Korea. Bookmark the permalink.